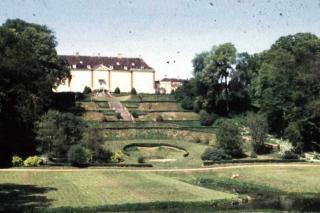 Ledreborg Palace and Park near Lejre was founded in about 1665. Since 1740, it has belonged to the Holstein-Ledreborg family. From 1746 until 1926 it was a count's estate. The main building consists of a two-storey wing with a central part dating back to the 17th century. In the 1740s, Johan Ludvig Holstein commissioned architects Krieger, Eigtved and Thura to extend and convert the palace. The forecourt, with gatehouse, side wings and curved buildings, with sweeping latticework, is also from this period. Ledreborg Park, which was also landscaped by Krieger, was renovated in 2004-2006. The park and palace are open to the public at specific times. When Count Johan Ludvig Holstein welcomed guests to Ledreborg in the 1750s, his status and breeding were clear from start to finish. The seven-kilometre avenue along which guests were driven swept into a forecourt where latticed gates, columns and curved buildings created a dramatic but organised spatial effect. The main building itself was adorned with stucco ceilings, tapestries, furniture and the count's large art collection, with pictures hanging frame to frame. The highlight was the park on the far side of the main building. It sloped away in terraces down the sides of Herthadal to the valley bottom and up the other side, rather like boxes at a theatre. Ledreborg was an original baroque total theatre. And fortunately it is exceptionally well preserved.